the Alliance for Bicycling and Walking (formerly Thunderhead Alliance), which coordinates local advocacy efforts, taking advantage of improved communication over the Internet. It is rumored that the leaked document below -- a version of the League's e-mail newsletter to its members -- was floated at a League Board meeting in early 2009, as a faction of the League Board attempted to reshape the League's mission. The League did not send this message and did not adopt the proposed changes -- actions which speak for themselves. You're receiving this email because of your relationship with Bike Walk America. Please confirm your continued interest in receiving email from us. I have exciting news about awards, and legislative efforts to protect the rights of bicyclists. But first, a new development that takes advocacy to the next level. Read about it here! Bike Walk America, a New Era! The League of American Bicyclists is changing its name to Bike Walk America, or BWA, effective immediately, BWA Board Chair Amanda Eichstaedt announced today. The change reflects a 30-year trend which started with Transportation Alternatives, in New York City. * the Thunderhead Alliance, once only serving bicycling advocacy organizations, now the Alliance for Biking and Walking. "Reform of the US transportation system will succeed much more quickly if we advocates extend our efforts beyond a single travel mode," Eichstaedt explained. "But please don't fail to notice, BWA puts 'Bike' first, and we always will. Bike Walk America stands ready to meet the challenges of the 21st Century." The bi-annual BWA Education Conference is ramping up, and it is destined to be a great one. Thanks to our expanded commitment to Safe Routes to School and a $200,000 grant from Nike, we will be expanding our kids curriculum to cover walking! Come to San Jose this summer to talk about the best way to teach cyclists and pedestrians; to help BWA continue to improve our curricula; and to hear news and updates from the world's foremost pedestrian and cycling educators. We've lowered our fees by more than 30 percent this year. All fees increase by $100 after the earlybird deadline of May 1. BWA today announced a new, top Bicycle Friendly Communities award level -- Diamond -- and the first Diamond awards, to Amsterdam, Copenhagen, and Bogotá. "BWA seeks out the very best," explained BWA President Andy Clarke. "We can not restrict ourselves to one country." On hand to accept the Copenhagen award was architect Jan Gehl, on his way to San Francisco. "We propose cycle tracks adjacent to the tracks for the historic cable cars, which will have handholds to assist bicyclists up steep hills. It will be more like Copenhagen," Gehl remarked. BWA also announced a Bronze award to Venice, Italy. "We acknowledge that bicycles are banned everywhere in Venice, and we are working on that," added Clarke. "But Venice has a first-rate bicycle programme whose logo bears an uncanny resemblance to ours, and she is totally car-free -- a great walking city." Latest! General Motors has requested Federal bailout funding for a motorized car cover that deploys like a convertible top. BWA supports this initiative but is lobbying for compatibility with rooftop bike racks as a condition for the funding. Please contact your representatives in Congress to lend your support! Background: GM's request follows from an unprecedented Afghan-US development agreement. As Afghan spokesman Hamid Karghai explains: "The burkha market has largely collapsed. Women want nothing to do with blue clothing. Yet every day, Afghanistan's widely-dispersed cottage dry-goods industry produces many hectares of blue cloth." "It's a win-win," stated Karghai, in a joint statement with USAID representatives. "We in Afghanistan benefit from a thriving industry. 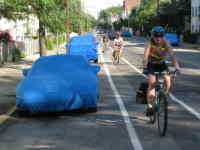 And, as Bike Walk America informs us, bicyclists in the USA can rest assured that the car-door problem will be solved." Pedestrian Education Associate, an office administration and logistical position requiring a valid driver's license and ability to accurately update our data-base and perform record keeping tasks. Safe Routes to Schools Coach. Work to train community leaders as organizers and instructors for parents and school chldren in Walking School Bus and bicycle rodeo techniques, as well as design of safe bike/ped environments. Bike Walk America promotes bicycling and walking for fun, fitness and transportation, and works through advocacy and education for a bicycle- and footwear-friendly America. The League represents the interests of America's 260 million bicyclists and pedestrians, including its 300,000 members and affiliates. For more information or to support the League, visit www.bike-walk.org. Weekend on Wheels 2009 in Twin Cities, Minn. will be the host for BWA's 2009 National Rally.